"Vegetable Rice" 菜飯 is an old fashion Chinese one dish meal. You can call it a Chinese style "plate lunch". It is actually a fried rice dish with grounded meat and vegetable topping. 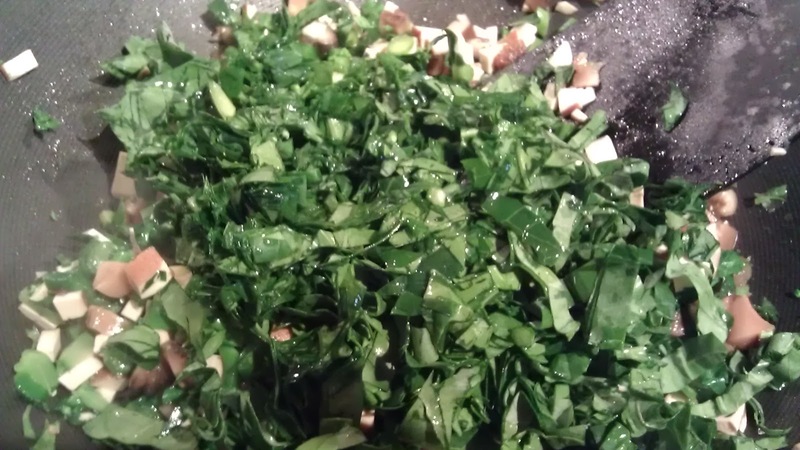 The name of the dish refers to the chopped greens in the dish. 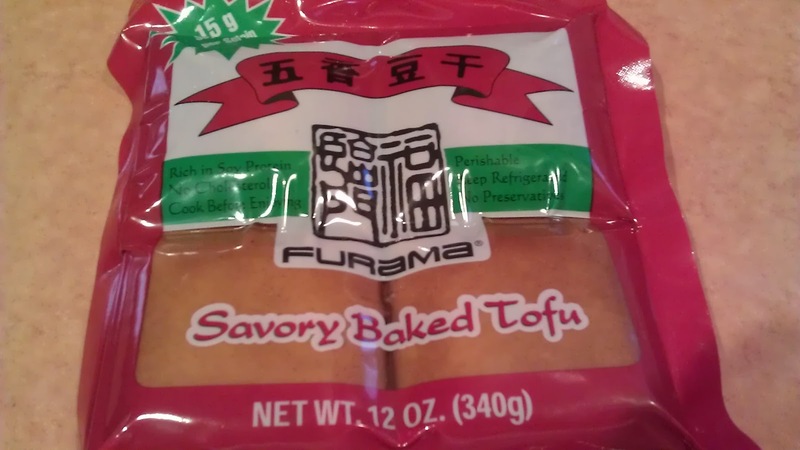 When my family had the restaurants in Singapore, this was one of the most popular lunch dish. Mother catered quite a few of these to Merrill Lynch Asia for their Luncheons meetings. This also was one of the favorite of my old gang at Marshall Field's. Mother used to spend a month here and she would cook lunches for my group. 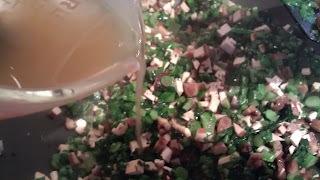 As with the "vegetable" here, you can use almost any kind of greens with a firmer "crunch" texture, I am using Gai Lan (Chinese Broccoli, 芥蘭) since it is in season. 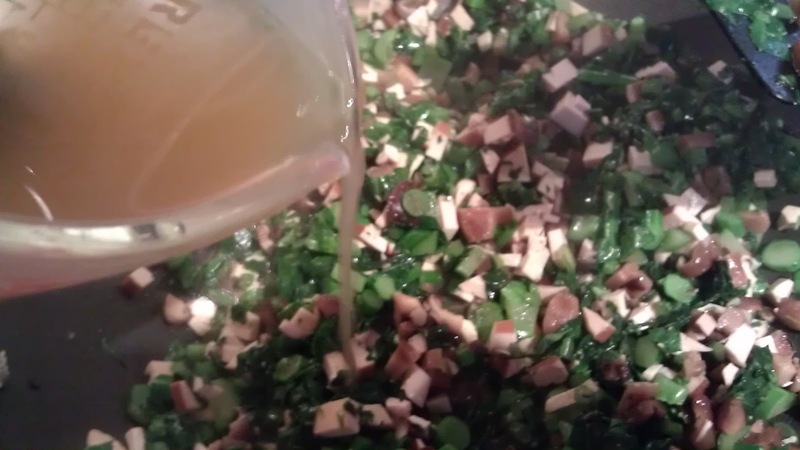 You can use Choy Sum (Chinese mustard greens, 菜心). 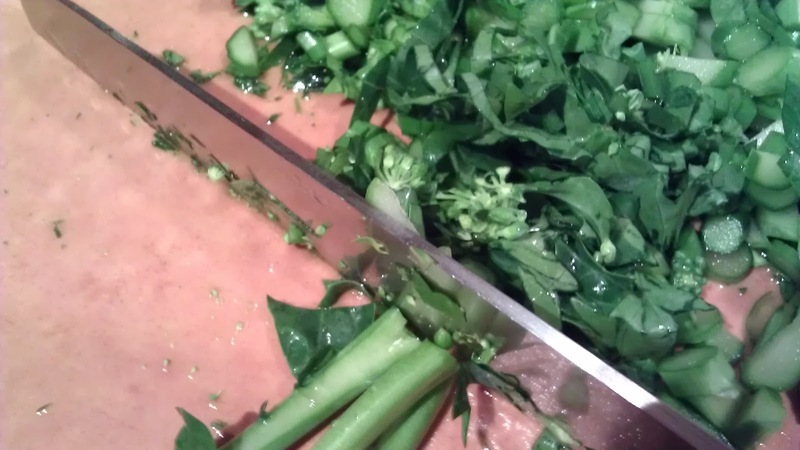 Not to diverse, Yu Choy (油菜) is a dish, not the vegetable itself. Yu Choy can be any greens with oil/sauce. Just a pet peeve, especially when someone who is not Chinese started to argue about this. Back to the recipe, you can also use Asparagus, green beans or cabbage. The vegetable varied in our restaurants, the truth here, this was a peasant dish, we used any left over trimming of the greens. I also found this interesting how the "big guys" at Merrill Lynch loved this dish so much.. So, finally here is the recipe. 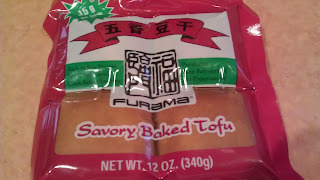 I modified it to make this vegan by using the 5-spice beancurd (pressed tofu) here for protein. 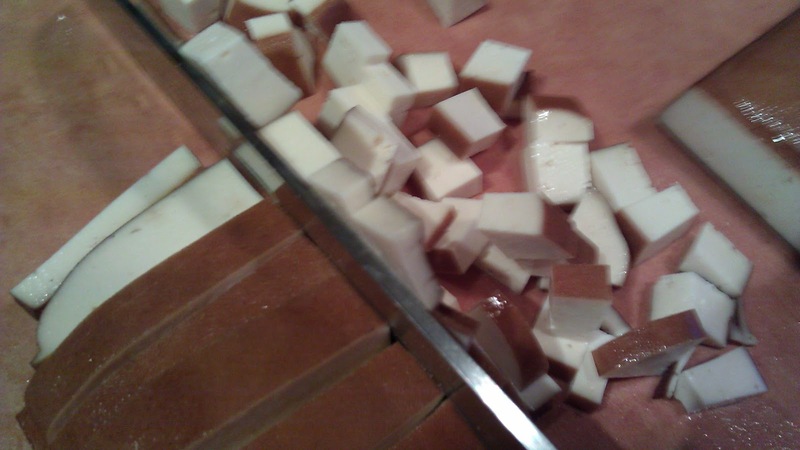 You can easily add ground meat, such as pork, chicken or even turkey. I would not use beef in this dish. 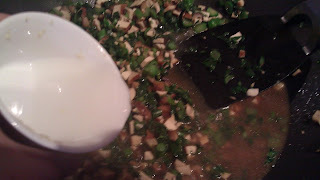 If you are using meat, I would also add 1 tbsp of Chinese Oyster sauce to the stock too. 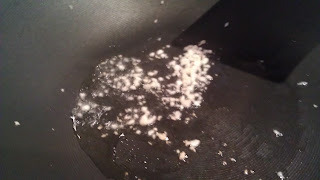 I took the eggs out of the fried rice, feel free to add 2 eggs back in your rice. 4 green onion. Cleaned, trimmed and chopped. 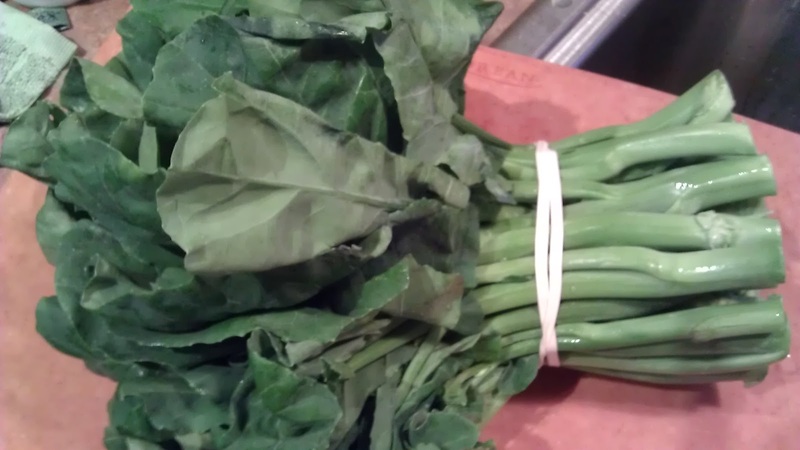 1 bunch of Gai Lan, Choy Sum or asparagus, about 1 lb. 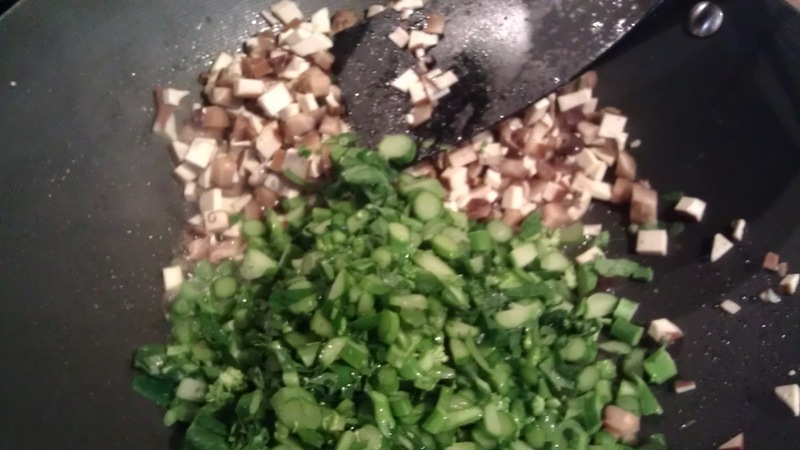 If you want, you can mix a few vegetable together. 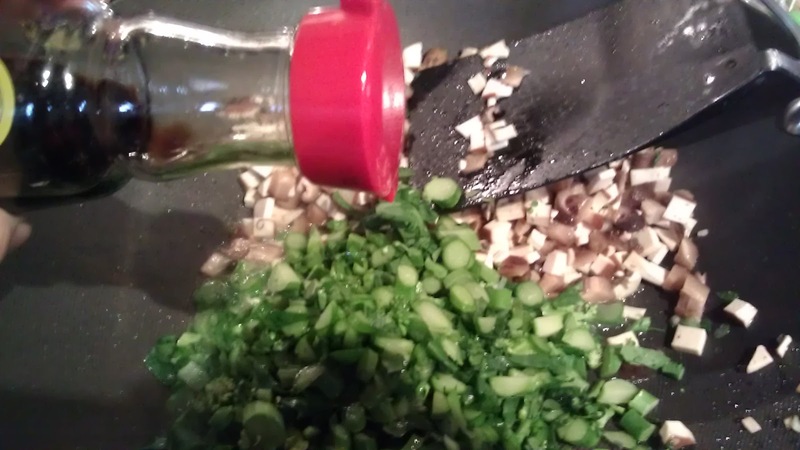 If you don't have time to go to as Asian store, try green beans with asparagus. 8-10 Dried Shitaki Mushrooms. Soak for 2-3 hours till rehydrated. 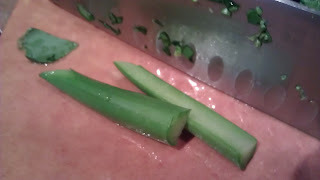 Used a scissors to remove the stems. 1 tbsp corn starch mixed with 1/4 cup of water. 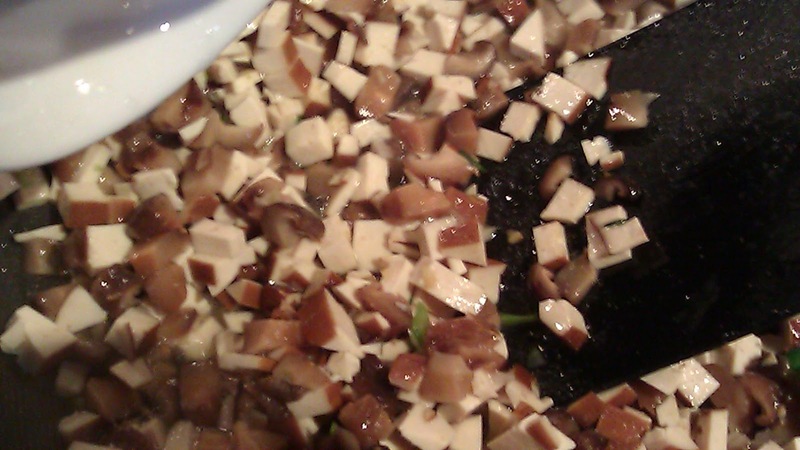 Brown tofu and mushroom, let it cook at 5 mins or so over med heat. Add the stem piece of the Gai Lan, let it cook for a few mins. Drizzle with shoyu sauce and 1/4 cup of water. Let it cook for 2-3 mins till the mushroom is tender. 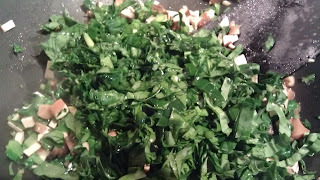 Add the green leaves and cook till softened. 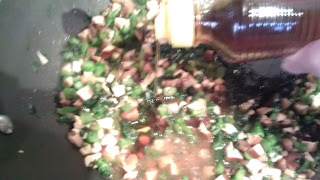 Add stock and bring it to a boil and cook 3-4 mins. Taste and season with shoyu and pepper as needed. Pour the topping over the fried rice. 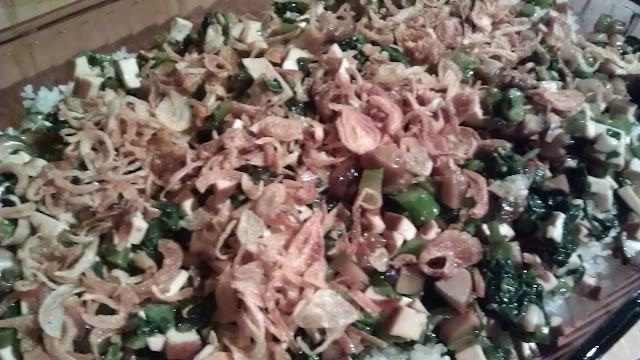 Top with fried shallots. 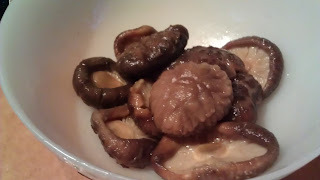 Okay I just made a really bad face when I saw those mushrooms. Is it necessary to add those? And you should have also added a picture of a complete prepared dish to make the recipe more appealing. 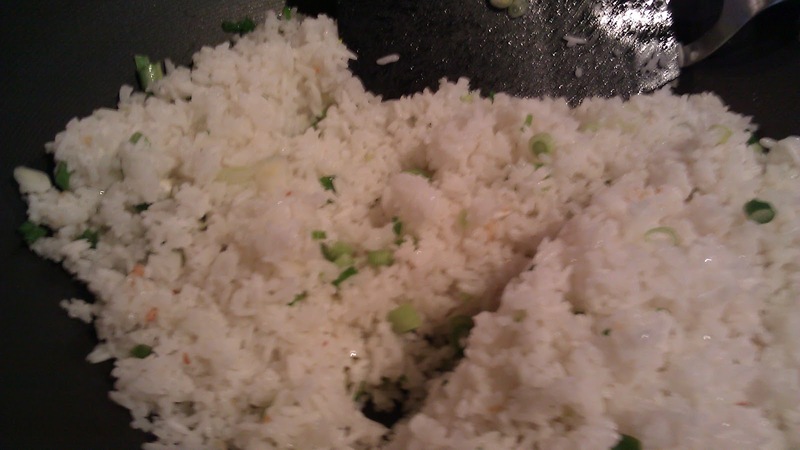 Chinese rice is the most favorite dish of mine and its very light in appetite.Chinese dishes are good usually for health because its not filled with spices.